Happy June! I have 4 more days until summer vacation and I am so ready! I have been extremely lazy today, hanging by the pool, reading and relaxing. It has given me a taste of what’s to come, and I think I will enjoy it. In the meantime, I am linking up with Farley’s monthly currently. Listening- as I said earlier, it has been a lazy day outside by the pool. I am currently watching and listening to this. Loving- Oh my! This is my favorite time of year to eat. I just love fresh fruit and there is such a wide selection where we live. I am loving all of the berries and apricots! Yummers! It really is. I have a great family and group of friends. I really can’t ask for anything more. Wanting- Summer! I think I have said that for the last few months, but I am four days away. I can do this. Needing- The last pedicure I had was right before spring break, so I am due. I will get one once school is done. 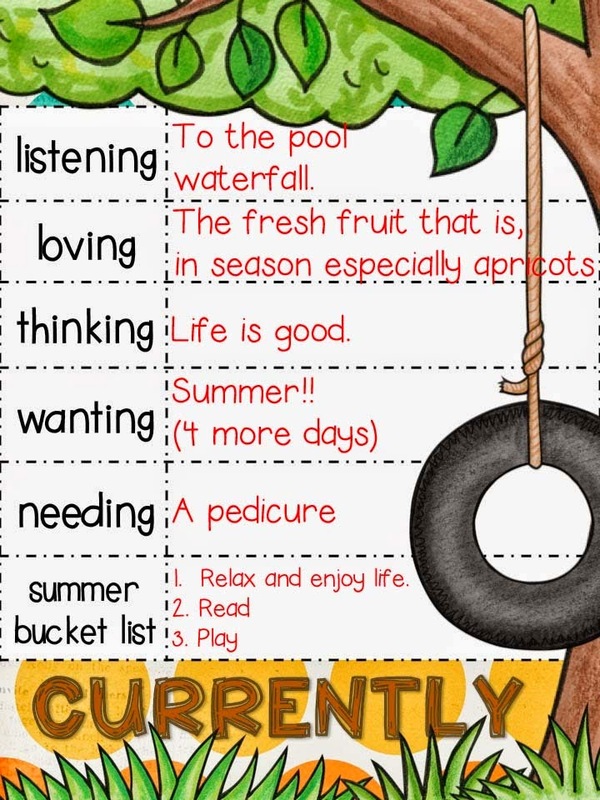 Summer Bucket List- I really want to take a break and relax this summer. I feel like my little man is growing up so fast. I want to play with him while he still wants to play with me. I know that soon he will want nothing to do with me. I also want to read some fun books. Do you have any suggestions? I hope you are having a lovely weekend. If you are on summer break, enjoy! It you are still working, summer will be here soon. Renee, I love your pool … I wish I had one!!! I am with you one kids growing way too fast. My youngest starts kinder next year and it floors me! Enjoy your summer & your little man! I wish you a relaxing and fun time! Come follow my blog or Facebook page! I am your newest follower! Lucky you, four more days until vacation. I still have 10 more days to go. I am so looking forward to this summer and would love to have your pool in my backyard! I totally agree with you… fresh fruit during this time of the year is the best.